The PPTAG was established in 2011 and currently has 15 members: Cook Islands, Fiji, Guam, Kiribati, Nauru, Palau, Papua New Guinea, Republic of Marshall Islands, Samoa, Solomon Islands, Tonga, Tuvalu, Vanuatu, Australia and New Zealand – all represented by their Heads of Training. The PPTAG is chaired by a member of the Executive Leadership Team (ELT), currently Police Commissioner Brigadier-General Sitiveni Qiliho from the Fiji Police Department. 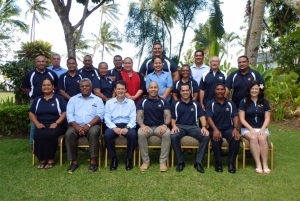 The PPTAG’s primary objective is to enhance capacity development (training) programmes in the Pacific region, with the key areas of focus being on Leadership, Ethics & Integrity and Investigations.